On Friday, August 26 the Brothers of Good Faith No. 95 met for the purpose of conferring the Fellow Craft Degree upon Brother Brian Carroll under the direction of Acting Master David Bird. 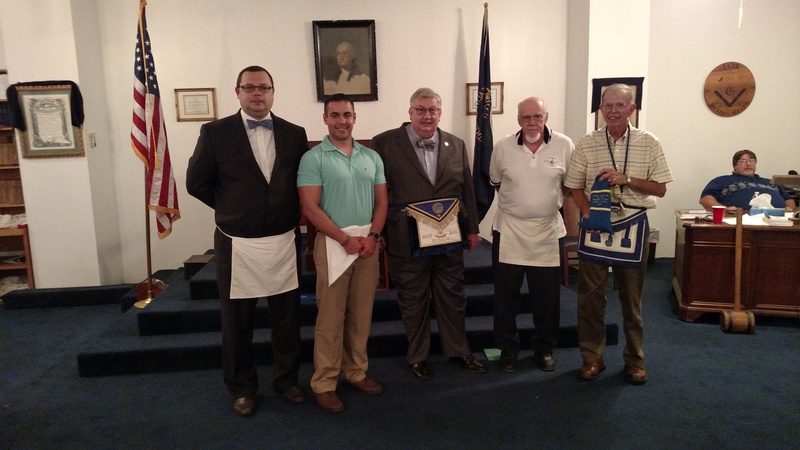 The Letter G Lecture was given by Worshipful Brother Dan Kemble, District Deputy Grand Master, District 18, Grand Lodge of Kentucky. Worshipful Brother George Scott gave the Stair Lecture. Worshipful Brother Adam Gross gave the Fellow Craft Charge. 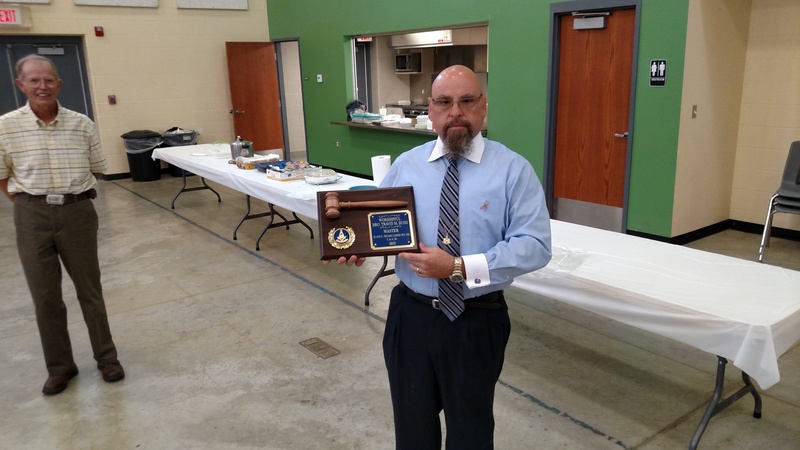 The Bluegrass Ritualist points earned by Brother Gross gave him the required number of points to attain the Senior Ritualist award. Pictured above, left to right: Ernie Hughes, P.M., Junior Steward; David Bird, Senior Warden; Worshipful Master Erich Creech, P.M.; Brian Carroll, our new Fellow Craft; Bob Lainhart, P.M., Treasurer; Bill Breeze, P.M., Chaplain; Paul Long, Senior Steward; and Orville Bryant, Tiler. Pictured above, left to right: Brian Carroll, Sammy Meyerratken, and Adam Larkin, Fellow Craft Brothers all. Brothers Sammy and Adam came out to support Brother Brian Carroll and to see the Fellow Craft Degree from the other side. 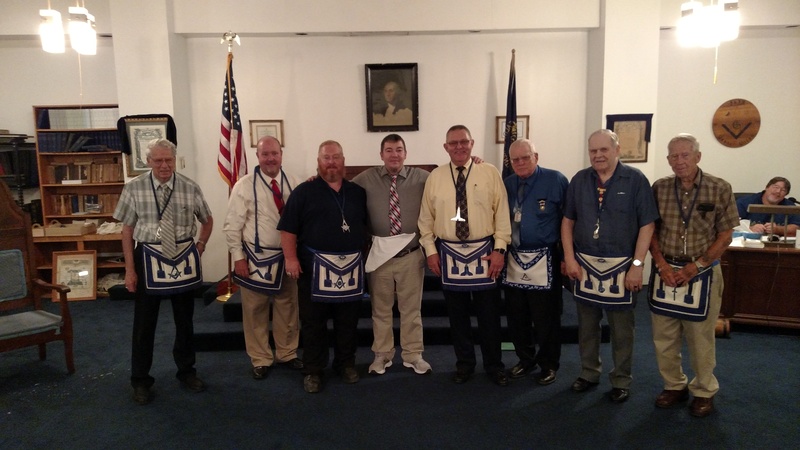 Pictured above, left to right: Adam Gross, P.M., Senior Deacon; Sammy Meyerratken; Dan Kemble, District Deputy Grand Master, District 18, Grand Lodge of Kentucky; Garry Kelly, P.M.; Worshipful Master Ernie Stratton, P.M.
Elvin E. Helms No. 926 was well represented on this occasion, with 5 total members present. This was sufficient to claim the District 18 Traveling Gavel. You can come visit our Lodge on Tuesday, September 13 to claim the gavel for your Lodge. As usual, we will be serving a great Fellowship Meal at 6:30pm followed by our Stated Communication at 7:30pm. If you’ve never been to Elvin E. Helms No. 926 please stop by and visit our storied Lodge in historic Petersburg, KY. On top of being one of the friendliest Lodges going and the great food that we serve at every meeting, we have one of the best education programs you’ll find anywhere. At our September Stated Communication our guest speaker will be Illustrious Brother Bill Lorenz. He will be presenting on the subjects of Magic Squares and Magic Numbers. 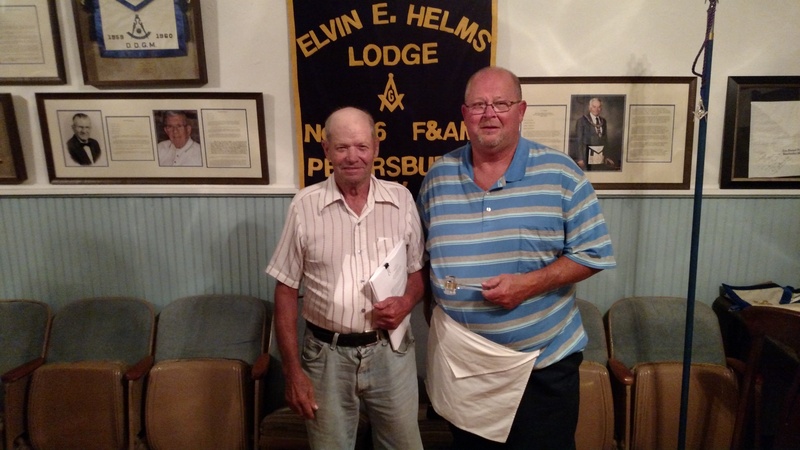 Elvin E. Helms Lodge No. 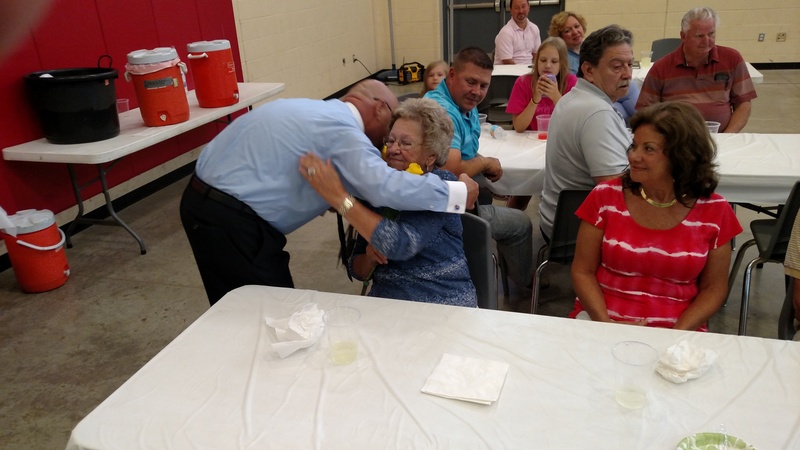 926 celebrated its 2016 Widow’s and Awards Day Dinner on Saturday, August 13, at the Petersburg Community Center. 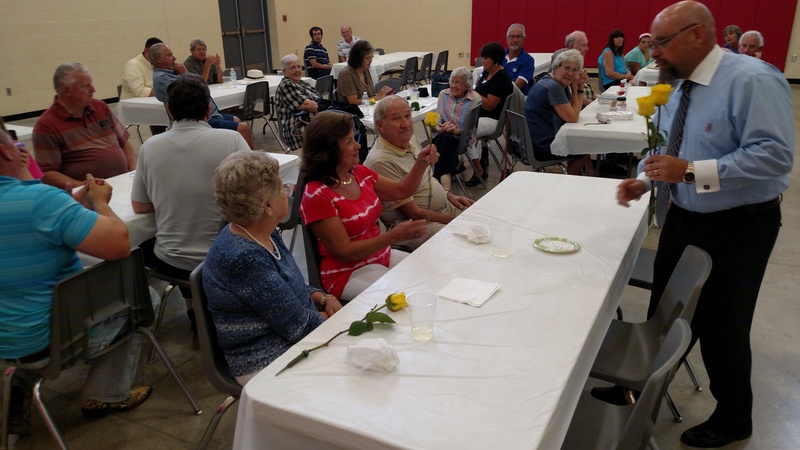 Members and guests enjoyed barbecue chicken provided by the Lodge and prepared by Holly Kemble. An array of sides and desserts were provided by other members of the Lodge. We had a great turnout for this year’s festivities. Some of the group are pictured above. 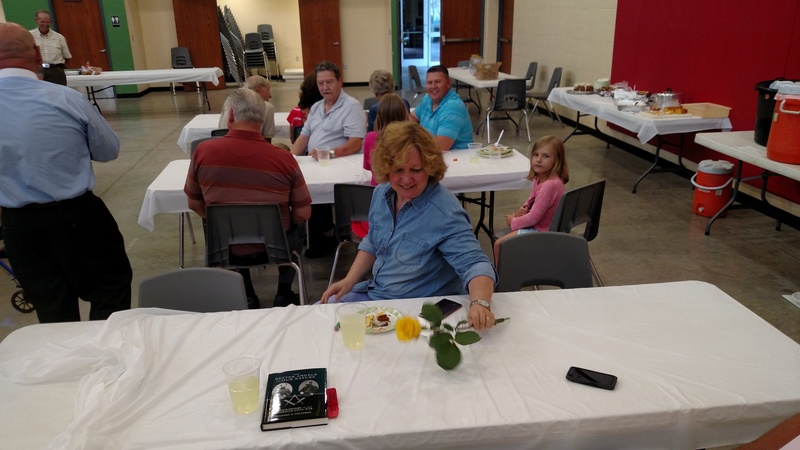 Our featured chef, Mrs. Holly Kemble. 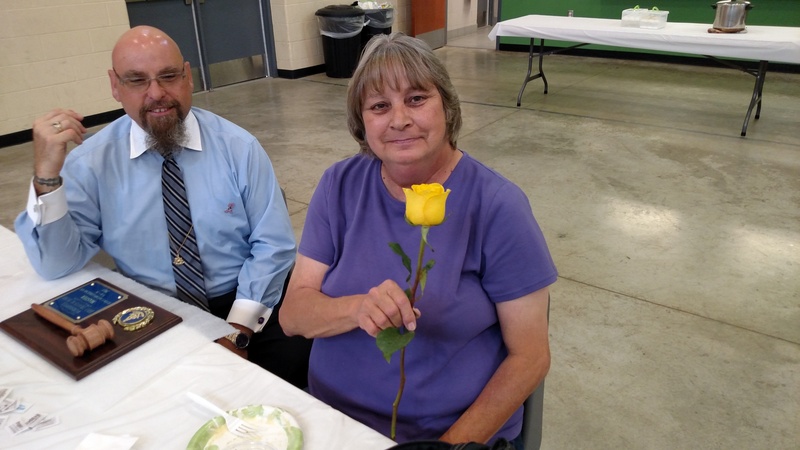 Ms. Debbie Wood with Worshipful Brother Travis Bush. 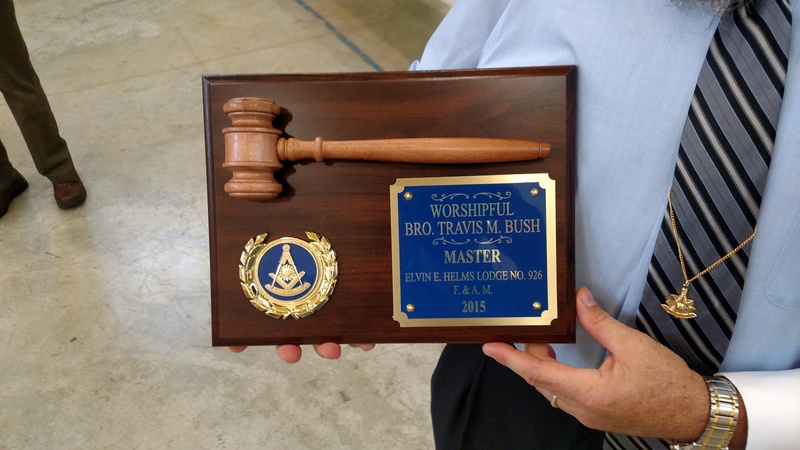 Worshipful Brother Travis Bush was presented with a plaque commemorating his service as two-time Master of our Lodge. Last but not least, Worshipful Brother Adam Gross won the split-the-pot. He donated his winnings to the Kelley Elementary Christmas Fund. It was another great night in Petersburg this Tuesday with lots of visitors and lots of upcoming activities. 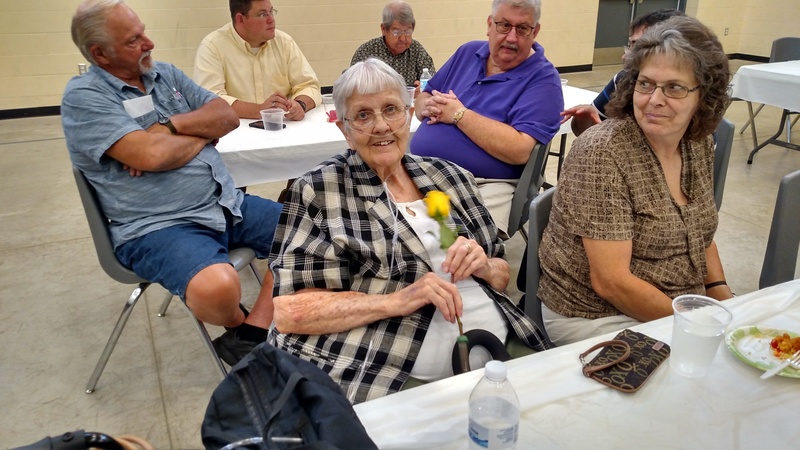 As a reminder, this Saturday, August 13 is our annual Widow’s and Awards Dinner, held at the Petersburg Community Center, 6517 Market Street, Petersburg, KY 41080, beginning at noon and ending at approximately 3:00pm. As usual this event is open to everyone who would like to enjoy the occasion with us as we honor our widows and present service awards. The traveling gavels did their job this evening and we had a full house with visitors from Grant No. 85, Good Faith No. 95, Demoss No. 220, Burlington No. 264, Boone-Union No. 304, Wilmington No. 362, Crittenden-Dry Ridge No. 694, and Hebron No. 757. Worshipful Brother Eric Creech of Good Faith No. 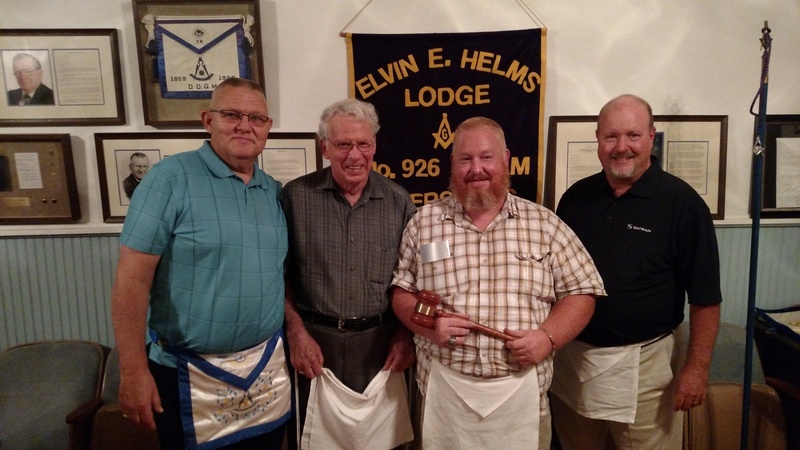 95 claimed the District 18 Traveling Gavel for his Lodge while Worshipful Brother Andy Canafax claimed the District 18 Scottish Rite Traveling Gavel for Grant No. 85. The next opportunity to claim the District 18 Traveling Gavel for your Lodge will be at the next Stated Communication of Good Faith No. 95 on Friday, August 26 at 7:30pm. The next opportunity to claim the District 18 Scottish Rite Traveling Gavel will be at the next Stated Communication of Grant No. 85 on Thursday, August 11 at 7:30pm. Thank you to all of the Brothers in District 18 for keeping these traveling gavels traveling! Pictured above, left to right: Worshipful Brother Andy Canafax, Master of Grant No. 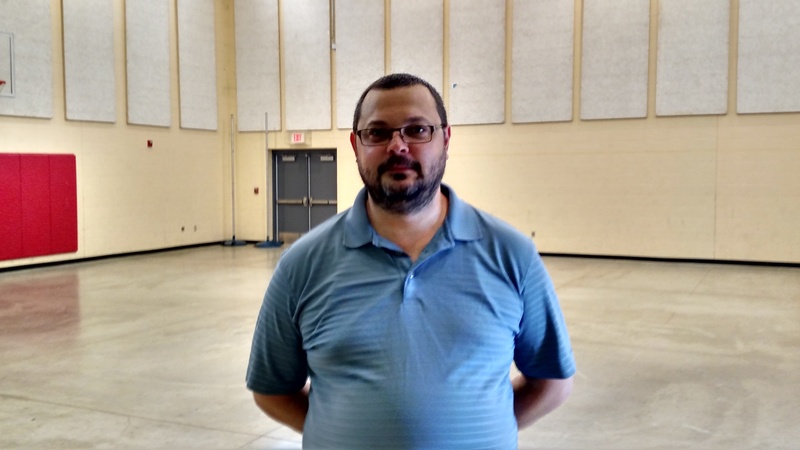 85; Worshipful Brother Eric Creech, Master of Good Faith No. 95. Pictured above, left to right are the four Brothers from Good Faith No. 95 that visited us this evening: Worshipful Brother Bob Lainhart, Treasurer; Worshipful Brother Ernie Hughes, Junior Steward; Worshipful Brother Eric Creech, Master; David Bird, Senior Warden. Pictured above, left to right are the two Scottish Rite Brothers from Grant No. 85 that visited us this evening: Worshipful Brothers Tommy New, Chaplain; Andy Canafax, Master. Last but not least, Worshipful Master Ernie Stratton passed the Constitution Quiz and received his Constitution Scholar pin from Worshipful Brother Dan Kemble, District Deputy Grand Master, District 18, Grand Lodge of Kentucky. 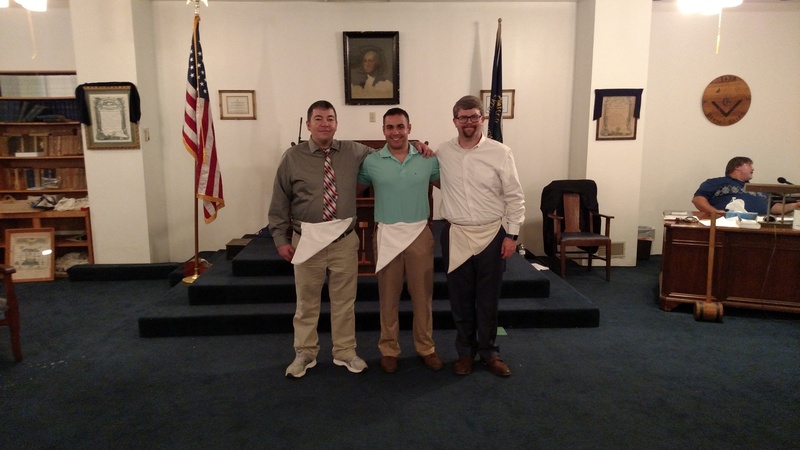 The education program for the evening was presented by Worshipful Brother Adam Gross and featured two papers. We, as Masons, know Tubal-Cain is depicted as a blacksmith. We do not know when he lived, but probably in the days when primitive man used tools of stone or flint to work naturally-occurring pieces of gold, silver, copper and meteoric iron into weapons, tools and ornaments for use in war or peace. At some stage, man utilized fire to liberate metals from their ores, and there came that magic moment, some thousands of years ago in Mesopotamia, when copper ores bearing tin were smelted; this first alloying of metals launched the Bronze Age, a great step forward in this ascent of man. This early metallurgy promoted the first explosion in international trade, as bronze coinage formed a novel means of exchange, and the cradle of civilization in the Eastern Mediterranean area thus spread to Europe. There is a definite metallic streak running through our Masonry. We were divested of money and metallic substances even before we entered the Lodge. In the Sectional Lectures, there is a strong allusion to extractive metallurgy with the mention of chalk, charcoal and clay as the emblems of freedom, fervency and zeal. Clay is our ‘Mother Earth’, providing both the metals and the refractories to contain them at high temperatures; from charcoal, we derive the heat energy to smelt and refine them; and from chalk, the flux to alloy with the gangue and separate it from the ore.
What of metals today? My career as a metallurgist has embraced the casting, working and fabrication of metals. Today’s readers may be interested in a short description of the five principal methods of shaping metals. 2. Working includes forging, rolling, extrusion, rod and wire drawing, and pressing in many ways. Both casting and forging to shape date from the days of Tubal-Cain. 3. Machining is only about 200 years old; generally, it includes turning, boring, milling, shaping and grinding, and is a finishing process for work-pieces first cast or wrought to a rough shape. 4. Fabricating by assembly and joining, such as bolting and riveting (the Sydney Harbor Bridge is a good example), welding and brazing, and soldering. 5. Powder Metallurgy is a spectacular development of the last 50 years, and involves the compacting of metal powders in a die, followed by sintering at a high temperature to crystallize them into union; many parts can be produced by mass production methods, ready for use without machining. If Tubal-Cain were the first artificer in metals, his disciples today are known as tool engineers, who provide the expertise to design and devise the machines, methods and tools to be used. It is not surprising that nearly all the Working Tools presented to us in our Craft Degrees are essential tools in the fabrication of metals; one cannot imagine a tool engineer without the benefit of the pencil and the rule, and the square and the compasses. Metals run like shining threads through the whole tapestry of human history; besides the invention of coin age, they have played a critical role in the invention of printing, the harnessing of steam and the internal combustion engine, the discovery and use of electricity, the achievement of powered flight, and the advent of nuclear energy. The art of Tubal-Cain, now called metallurgy, is unfolding the secrets of nature and science. The GAOTU provided the materials in the firmament, and man’s inspired fashioning of them by tools, is, I hope, stamping our work divine. The second paper presented was written by Brother John Hubbell, Sharon Lodge No. 327, McLean, VA. While thinking about what to do for this program, I considered many possibilities. As you know, there are a ton of resources out there full of fascinating lectures and works on Masonry. Our own library downstairs is full of them. Rather than repeat what I’ve read, I thought I’d talk about some of the revelations I’ve had about Masonry in my “vast” experience of two years as a Master Mason. I’ll say at the onset, these are my own ideas, and certainly don’t necessarily represent the official positions of Masonry. I am the product of two people who, among other things, were both psychologists. My mother’s favorite joke was, “How many psychologists does it take to change a light bulb? One! But the light bulb has to want to change”! To me this explains in large part why we don’t recruit and in fact why it would be self-defeating to do so. If we are to have a hope of achieving our stated goal of making good men better, first those good men must want to change. The most valuable lessons in the world, forced on someone unready or unwilling to hear them are wasted. Conversely, the simplest lesson passed on to someone willing to hear it and seeking self-improvement can change that person forever. A small anecdote. A Mason I know was recently up for a very big promotion and, during the interview process, the owner of the company told him that when he had been hired originally, the owner had thought of him as competent but unremarkable. However in the last year, the owner was amazed at the change in him. Other managers and employees had noticed as well and that his improvements across the board were the reason he was being given the promotion. The owner asked him what had been the genesis of the big change. My friend’s only response, the only thing he could think of which fit the timeline, was that he had become a Mason. In a later discussion he asked me what could be so magical about Masonry that his co-workers and superiors could see so remarkable a difference. My thought and my answer to him was that while Masonry had certainly given him some impressive tools, he was the one who had made the most important step to becoming a better man. He had chosen to do so. The Many Layers of Masonry. If any of you have seen the movie Contact with Jodie Foster, or (being a fan of books, I’ll say) better yet, if you have read the book by Dr. Carl Sagan, you might remember that the core element to the plot is the message they receive from outer-space. This message at the beginning seems to be just the repetition of non-random number groups, but as the people in the story dig deeper into the message, they find out that there is video and sound imbedded in the signal. They dig deeper still and find there are schematics and mathematical formulas, some of which are beyond our understanding. How does this relate to Masonry? I think that Masonry is like that message. If you want this just to be a simple fraternal organization, it can be. If you want to dig a little deeper, you can learn as much of the ritual as you wish and try to understand the lessons behind them. If you want to really dig, and look at our ancient history, dive into the incredible amount that has been written by Masons attempting to learn whence we came, and perhaps where we are going, you can do that as well. Perhaps you will be that Mason who finally finds that secret word which was lost forever at the death of our Most Excellent Grand Master Hiram Abiff. Masonry seems to be, limitless. And perhaps that is the point. We will find as much as we are willing to seek and work for and maybe, as much as we are ready to understand. Why we are here and what it means to be a Mason. For me the oft asked question of, “Why are we are here?” is no longer a question. I believe we are here to live, learn, grow and help others do the same. Masonry, what we teach, how we interact and what we profess to believe has reinforced that belief. In the Entered Apprentice Degree we show new Masons that we care little for their material success in this life. In the Fellowcraft Degree, we admonish them to walk uprightly in their several stations in life, and in the Master Mason degree we remind them that Master Masons should spread the cement of Brotherly love and affection, that this will unite us into a Temple of Living Stones. There are numerous other examples, but just about everything we do as Masons helps us become better men, and helps others to do the same. Yes, we require it so you have something on which to base your oath, but also, if you don’t believe in a “Higher power” you must think yourself the top of the food chain, and since the stated purpose of Masonry is to make good men better, if you think you are the best there is, there’s not much we can do for you. We could print out ritual and catechisms and hand them to the candidate with instructions to learn them; while they might learn the information, there would be no bond, no spread of brotherly love or affection. In the mentor/student relationship, the student spends energy to show up and learn and the instructor spends energy to show up and teach. The student sees that both of them are spending energy, and I think that helps show the importance of what is being taught. In the Master Mason lecture there is a passage which I think is applicable, “Thus was man formed for social and active life. 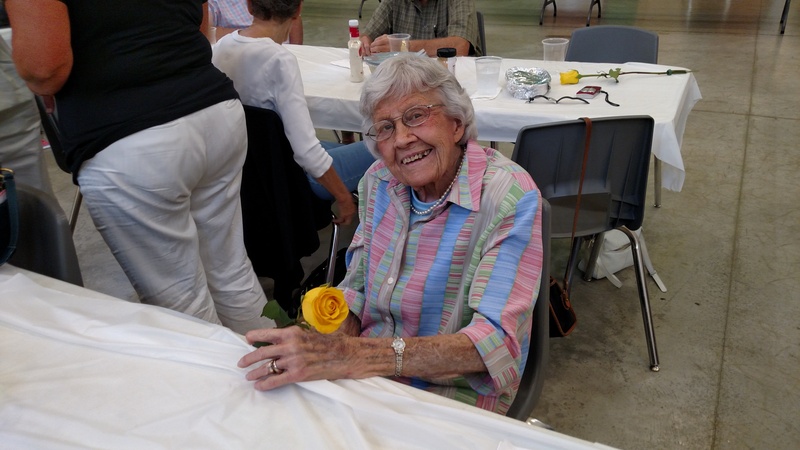 The noblest part of the work of God.” The increased depth of friendship between student and mentor, where not just the ritual or catechism is taught, but also side lessons, and sometimes just friendly conversation, to me proves the value of process. While we seek to learn ritual and degree catechisms perfectly and be able to return them perfectly in Lodge, I’ve learned the importance of the imperfections as well. When returning my Master Mason’s catechism, I so wanted it to be perfect. My wife years ago labeled me a “closet perfectionist”; a label which I originally dismissed, but as with many things my wife has said, I had to ultimately agree with her for the same reason I always do. She was right. While returning the catechism, I was doing it perfectly and was so proud of myself when I then hit a section which is ironically the same in every degree and screwed up. As is often the case in situations like this, a heartbeat after I made the mistake, my brain, while sitting on the sidelines listening to my mouth said, “Wait! What did you just say!? !” To which the other half of my brain replied, “Doesn’t matter, you just blew “perfect”. Oh well, nothing to be done but back up and prove to yourself and everyone else you really aren’t a complete idiot and say it the right way this time and move on.” I did, and the rest of the return went well. After the lodge had closed, I was in the kitchen licking the wounds of my pride (yeah I know, I take the whole pride in perfection thing too far) the Worshipful Master of the Lodge, Mike Pierce, came into the kitchen and complimented me on how well I’d done with the examination. Since that Closet Perfectionist thing was still in control, I said something to the effect of, “It was good, but it wasn’t perfect.” Worshipful Pierce then said something which changed my whole perspective on things. He said, “It was good because of the mistake, not in spite of it. You saw the mistake, backed up and took another run at it, proving to us, and more importantly to yourself, that you really did know the correct words, and then, you moved on.” Not to make too big a deal of it, but that was an earthshaking moment for me. Not to be perfect? Unheard of! But that was just one more moment in my Masonic journey of personal growth. It forced me to think of all the good and valuable things in the world which would not be so, without imperfections. What would a gold ring be without the added impurities which give it the strength to be durable? I don’t know, but pure gold makes for a good investment, but crumby jewelry. What would steel be without the impurities which give structural steel the strength to support a sky scraper? I don’t know, but I know I wouldn’t want to walk in a city built with it. I could go on with examples both obscure and minor, but I will close this by saying I want you to imagine the most beautiful sunrise or sunset you have ever seen. Hold that image in your mind. Think about what makes it so stunning, the different hues and reflections, the light and colors bouncing off everything. Now take away the clouds. The presentation was concluded with the Virginia Presentation Volume version of the Closing Charge. The Petersburg Community Action Commission held a back to school event at the Petersburg Community Center featuring a backpack program. The backpack program is designed to ensure that all students have the proper supplies before they head back to the classroom next Wednesday, August 17. Elvin E. Helms No. 926 regularly participates in this program. 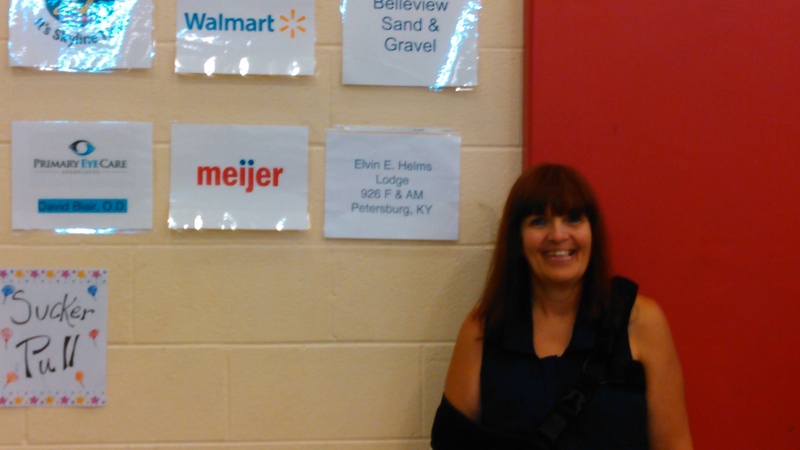 Pictured above is Debbie Bush, wife of Worshipful Brother Travis Bush, standing next to our Lodge’s card on the “thank you” wall. Elvin E. Helms No. 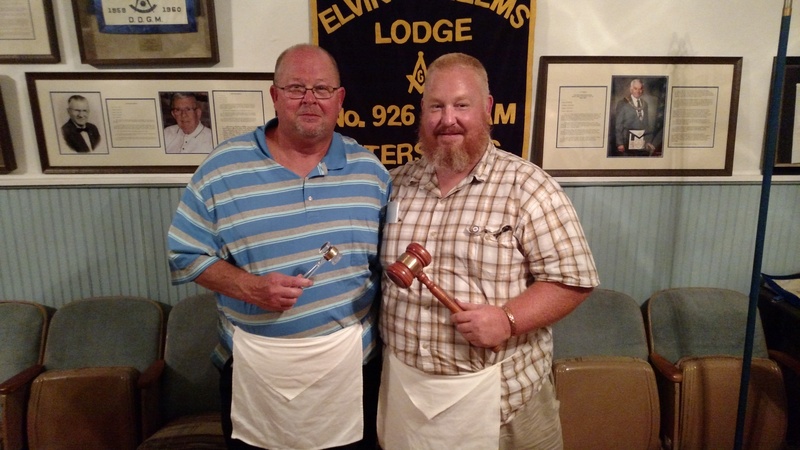 926 is currently in possession of the District 18 Traveling Gavel and the District 18 Scottish Rite Traveling Gavel. Both will be available this Tuesday, August 9th to be claimed for your Lodge. Join us for a fellowship meal at 6:30pm followed by our Stated Communication at 7:30pm.